Sunrise as we pass El Morro fortress. Want this view as you enter the harbor? Book a stateroom on the port (left) side of the ship. What to do in San Juan on your own. I love a port day San Juan. And good thing, too, because almost every cruise to the eastern Caribbean includes nearly eight hours in San Juan. This small volcanic island is lush, tropical and known for its miles of soft sandy beaches and mountainous El Yunque, the only tropical rain forest in the U.S. National Forest system. As an alternative to a planned shore excursion, I always recommend a walking tour through Old San Juan. There’s plenty of time to explore the old city, even if you arrive at 3pm and depart at 8pm. The pier is right there across from Old San Juan. Here are my suggestions for what to do in San Juan on your own walking tour. First things first. Grab your camera and stake out your space on the port (left) side of the ship for the magnificent approach into historic San Juan harbor. You’ll sail past what is possibly the most spectacular sight in the entire Caribbean. Rising majestically 140 feet above the sea, flying US, Puerto Rico and Spanish military flags, is Castillo San Felipe del Morro. Rounding the turn past El Morro promontory and entering San Juan harbor. Nicknamed El Morro, the massive stone fortress sits on a rocky promontory surrounded by the Atlantic Ocean and the San Juan Bay. Built between 1540 and 1783 to protect its harbor and city from invasion, El Morro features a maze of secret access tunnels and dungeons. Click! To get to El Morro, it can take about thirty minutes to walk there from the port, going straight uphill through Old San Juan. Along the way you’ll pass small shops, quiet cafés, centuries’ old churches and interesting architecture. Or, you can take a taxi from the pier. There is a small entrance fee to the fortress complex, but it’s worth it. This is a great place to bring the kids. Intrigue abounds with tales of daring pirates and sunken ships to keep their interest. Outside of the fort, there’s an enormous park and gardens where kids can burn off some steam. If you’re into history, there’s a small museum that’s run by the U.S. National Park Service. Kids need to run? Let ’em loose here. Great for kite flying, too. After touring El Morro, allow yourself at least a couple of hours to meander your way back through town. Old San Juan is a charming area where colonial ambiance is maintained with a good dose of national pride. From the magnificent 18th century Spanish architecture to the cobblestone streets and well-kept doorways, a visit to this old city is like a journey back in time. Stop for a cold drink and lunch in the tropical courtyard patio at El Convento Hotel, a 356-year old former convent turned into an incredible 5-star hotel. It’s difficult to miss this ochre-colored building with its black and white stone steps and heavy, dark wood entrance. To get there, walk downhill from El Morro to 100 Cristo Street. There are dozens of helpful uniformed police in Old San Juan ready to assist with directions. Enjoying lunch in the courtyard at El Convento Hotel. After a snack and a drink at to El Convento, take a short detour into the Cathedral of San Juan Bautista. It’s the burial place of Juan Ponce de León, the famous explorer who was looking for the Fountain of Youth. Some people believe the magical waters are somewhere in the rugged mountains of El Yunque. Or maybe it’s in one of the mojitos at El Convento! Walking through Old San Juan at the Quincentennial Square. Lunch option #2 with a local flare; a visit to the El Jibarito restaurant. Located at 280 Calle Sol, El Jibarito is bustling at lunchtime with families, shoppers and a few tourists who have stumbled upon this Old San Juan favorite. 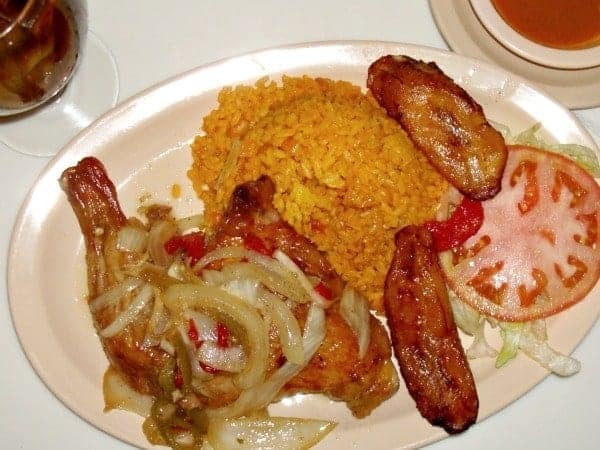 While my friend ordered the minute steak, I went for a traditional Puerto Rican dish, roast chicken, plantains and rice and was not disappointed. Wind your way over to Barrachina, located one block from the Governor’s Mansion. This is the restaurant in Old San Juan that claims to be the birthplace to the famous Pina Colada. Some people believe that, in 1954, it was Don Ramon “Monchito” Marrero, the bartender at the Caribe Hilton Hotel, who came up with the idea of a drink from mixing rum, pineapple juice, coconut cream and ice in a blender. It’s the island’s favorite drink. Alternatively, if you’d rather make it a beach day, a short taxi ride from the port takes you to the popular Condado Beach, a small slice of paradise. Adjacent to pristine beaches, this lively tourism area hosts countless shops, restaurants, night spots, casinos and of course, hotels. You can stroll Condado’s main road, Ashford Avenue, and end up walking along a lovely seaside pathway. The avenue ends at a beautiful, intimate beach and the other side reveals the lovely Condado Lagoon. On my first visit, I didn’t know what to do in San Juan. I signed up for a shore excursion to El Yunque and really enjoyed the experience. And if it’s your first time there, you may want to leave the port area and Old San Juan to see the rest of this scenic island. But for me, I prefer a walk through the narrow cobblestone streets of Old San Juan, window shop and enjoy an authentic Puerto Rican lunch. What ever you decide to do, you will surely enjoy your time in San Juan. Hi Sheila – Congrats on your daughter’s graduation! The only real way to see “everything” is to purchase an island tour, either through your cruise line or an independent tour operator. A half-day tour to El Yunque rain forest is very interesting and an easy option. Since your day in San Juan has an all aboard time of probably 2:30 or 3pm, I might suggest a walking tour of Old San Juan and make your way up to El Morro fortress. Maps are available either onboard or at the terminal. You’ll have a chance to see the old city, have a lunch at a café or restaurant, admire the beautifully-kept buildings that line the European style narrow streets, explore the centuries-old fortress and maybe do a little shopping. Shore excursions in San Juan for a half-day will probably be in the $65-100 price range per person, whether through the ship or an independent company. While San Juan has some very beautiful beaches, you won’t have a chance to see much else of the island if you opt for a day at the beach. Aside from a tour to the rain forest, a walk from your ship to the fortress will give you an opportunity to see a beautiful part of the island. If someone has difficulty with mobility, it’s an uphill walk to the fort and an easier downhill walk on the way back. Of course you can always get a taxi from the port to the fort. Have a wonderful first-time cruise! Thank you for your email. Cruising into San Juan on Wednesday, June 14th. First time cruisers, daughter’s Graduation/18th Birthday trip. Arrive at 7am Depart at 3:30 p.m. Suggestions for first timers who want to absorb everything? Thanks for your nice comment. You’ll have a wonderful day in San Juan. If you decide on a self-guided walking tour in Old San Juan, try to allow time to have a drink or snacks (or both!) at El Convento. Bon Voyage! Thanks for your post. We booked Celebrity cruise in April – first stop is San Juan, Puerto Rico. My husband and I prefer doing things on our own and I got a lot of info from you. Thank you for your post, we are crusing on Carnival Vista on Feb. 25 and are arriving in San Juan 28…I Love taking photos and exploring. Hi Tina, thanks for your comment. A walking tour of Old San Juan, El Morro Fortress and lunch or a visit to El Convento Hotel can make for a very nice day. There is an admission to the Fortress. Camera at the ready on the approach as it always seems more dramatic…I don’t know why! Have a wonderful cruise. Thank you so much for this article! We are cursing to San Juan this Christmas and the cruise line really does not offer a lot of choices that are suitable for our family. I have been looking and looking for something fun for all of us and you information has been very helpful. Especially the information about the photo ops coming into port! I am a photographer in Destin, Florida and I love getting costal shots from other arounds around the world!! So again THANK YOU!